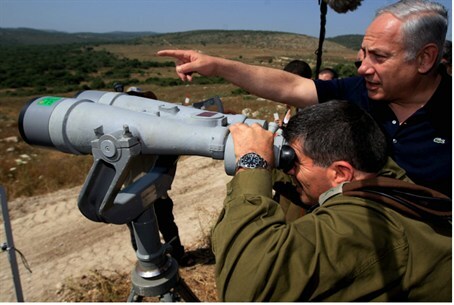 As Assad called to crush his enemies, Israel called to fortify security along the Syrian border. Speaking at the weekly cabinet meeting, Netanyahu noted that the fence built along the Egyptian border has “completely stopped the entry of infiltrators into Israel.” Would-be illegal entrants have reached the fence and have been taken to Israeli facilities, he said, but none have stealthily entered Israeli cities. "We intend to stretch an identical fence, with some necessary changes due to the different conditions, along the Golan Heights," he explained. "We know that on the other side of our border with Syria today, the Syrian army has moved away, and global jihad forces have moved in," he said. "We must therefore protect this border from infiltrations and terror, as we have successfully been doing along the Sinai border." The Golan has suffered “spillover” violence as shells from fighting in Syria hit communities there. Syrian President Bashar Assad's speech Sunday is unlikely to calm the situation; the embattled president called on the country to mobilize to fight his enemies. In addition to those concerns, “I also submit to the Cabinet the fact that the Syrian regime is very unstable, that the question of chemical weapons there worries us,” he continued. Israel is “coordinating our intelligence and readiness with the US and others so that we might be prepared for any scenario and possibility that could arise,” he added. A security official told AFP that the new fence in the Golan Heights would be along the outline of the old one. The official noted that Israel had already completed some 10 kilometers (6 miles) of the new Golan fence, and had "about 60 kilometers (37 miles) to go." The official said he believed the work would be completed in the course of 2013. Israel captured the Golan from Syria during the 1967 Six Day War and annexed it in 1981.